A West Palm Beach police officer is accused of stealing more than $1,000 from a man who was under arrest. 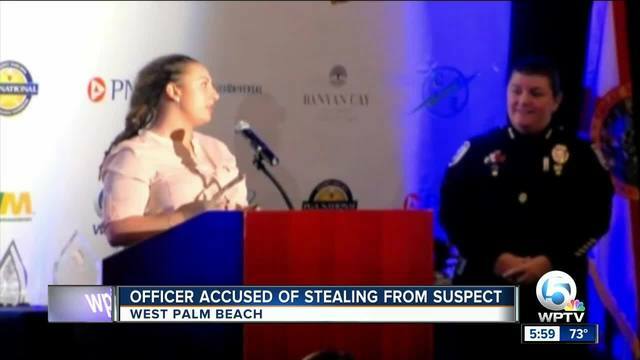 A West Palm Beach Police Officer is accused of stealing more than one thousand dollars from a suspect she arrested in October. Officer Nicole Palladino was arrested Thursday and is facing charges of grand theft, official misconduct, and possession of a controlled substance. Palladino responded to a call about a driver stopped at a traffic light on Palm Beach Lakes Blvd near I-95, the caller said the driver was asleep at the wheel and had gone through two full light cycles without moving. When Palladino arrived, the driver, Timothy Saintil, was allegedly still asleep at the wheel and had the car in drive with his foot on the brake. Palladino placed Saintil under arrest and called for back up. Another officer arrived and searched Saintil who had a large sum of money in several pockets. That officer put the cash into a clear plastic PBSO prisoner property bag, according to the police report, and was handed to Officer Palladino. Another officer witnessed the transfer of the bag containing the cash. The officer who collected the cash said he did not count it but noticed there were several hundred dollar bills. The police report says Saintil looked at the PBSO property bag before being taken to jail and became very vocal when it only said 48 dollars. He said at the time of his arrest he had 900 to 1000 in one hundred dollar bills and numerous one dollar bills. A sergeant then conducted a search of Officer Palladino’s patrol car with Officer Palladino. During the search, the report says Palladino “produced a one-hundred dollar bill and 20 dollar bill,” stating that she found the bills between the passenger seat and the center console. Investigators searched Palladino’s car and say they found $1,003 cash in a pouch located within a personal seat organizer that belongs to Palladino. The police report also says that inside of Palladino’s duffel bag was a plastic bottle with 7 ecstasy pills. Officers reviewed Palladino’s body camera and saw her “manipulating a clear plastic bag which contains the money. The video ends and then seconds later a new video is initiated with Officer Palladino seen and heard counting 48 one dollar bills, then she completed the PBSO Prisoner Property sheet. Police believe the video was ended and started manually using the “event” button. Earlier this year Palladino received the award of valor for her heroic response pursuing an armed suspect who was firing at pedestrians with a rifle. Her officer history shows she’s been reprimanded before for not turning on her body camera, in one incident another officer’s camera caught her using profanity towards a citizen, which she was also reprimanded for. Palladino is the third West Palm Beach Police officer to be accused of stealing cash on the job in the last year. In December of 2017, former officer Zachary Immler was accused of taking more than six-thousand dollars during a search warrant. In January 2018, officer Crystal Homic was accused of stealing 100 dollars from a suspect. “If I had a consultation with the chief and with the deputy chief, I would also take a look to review their training procedures and make sure that they are properly emphasizing ethical training,” said Former New York State Police Captain Robert Buccholz. Buccholz said the fact that we have seen these arrests made means the department is also sending a message that police misconduct will not be tolerated. West Palm Beach Police Chief Sarah Mooney did not want to comment further than what is in the police report. Palladino has been with the department for five years. Before the patrol division, she worked in the narcotics unit. Palladino has been on paid leave since the October traffic stop.